Compact sedans are actually more like a stretched version of the regular hatchbacks. Even after staying same under the skin, their feature loaded approach and extra boot space make them a lot more practical over their hatchback counterparts. These are the top six compact sedans of India. Honda recently launched the all-new Amaze with a starting price tag of INR 5.59 lakh for the base petrol model and INR 6.69 lakh for base diesel variant. 2018 model of Amaze is highly inspired from US-spec Accord in terms of design. New Honda Amaze carries a nice 420-liter boot while its refined petrol and diesel engine with leading power values make it very frugal for everyday use. Tata Tigor is priced at INR 4.84 lakh (base price for petrol model) and creating a wide gap between the next same segment car in India. It comes with both petrol and diesel engine options while gearbox on offer is just a 5-speed manual unit. New Maruti Dzire starts from INR 5.56 lakh for the petrol engine and easily sells 15000 units every month. 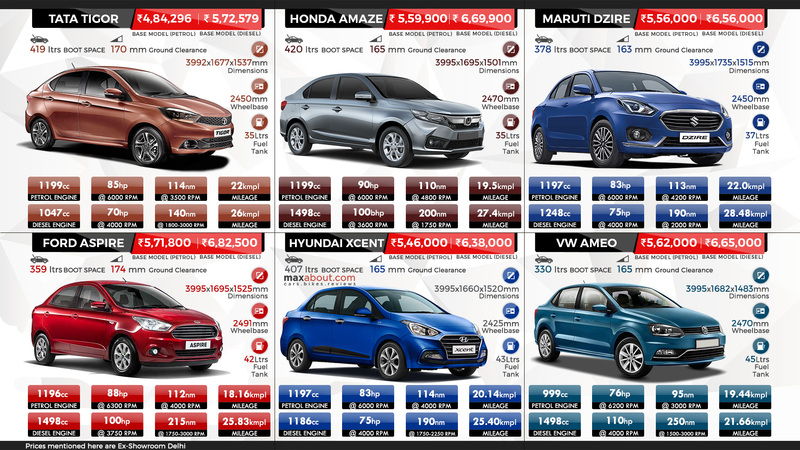 The brand value of Maruti overtakes all as collaborative sales of even all the compact sedans won't even reach the milestone achieved by Dzire in India. It carries a considerable boot at just 378 liters. Ford Aspire starts from INR 5,71,800 and carries a powerful 100 HP diesel engine. The 88 HP petrol motor is even one of the most powerful among its segment rivals. It comes out to be the only compact sedan that carries 6-airbags in its topmost trim. Aspire's 2491 mm of wheelbase is the longest among all other in the same segment. Hyundai Xcent also has a useful 407-liter boot while its petrol engine is quite more powerful than its diesel counterpart. Along with Tigor, it also carries a three-cylinder diesel engine. VW Ameo comes out as the most powerful option with 110 HP and 250 Nm of torque from its diesel engine. It carries a small 330-liter boot.